I knew people loved ceviche, but when I recently posted a picture of a big bowl that I made for my mom, people went crazy. It’s a dish that I grew up eating. It’s a popular Ecuadorian dish and I am of course half Ecuadorian so it’s natural that I love it so much. Other countries make it different ways but this happens to be my favorite. 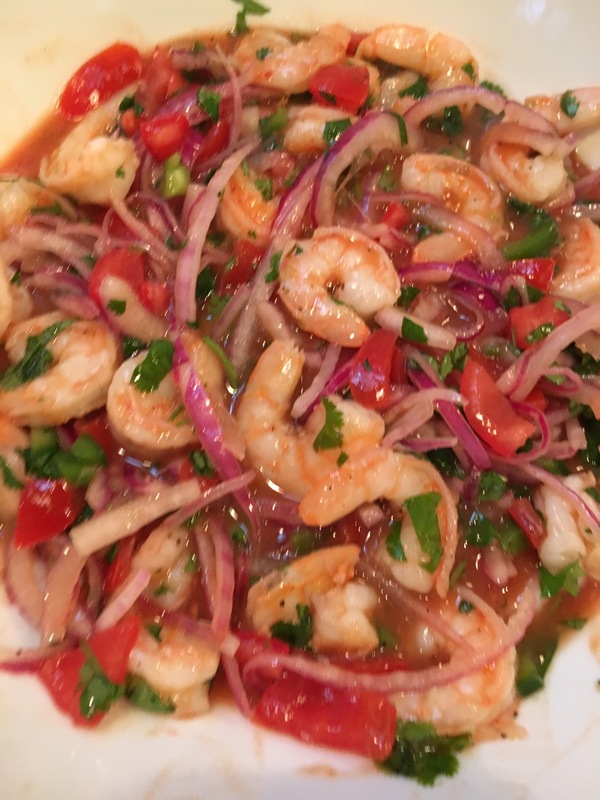 Last night we had a big dinner for my moms 48th birthday and she requested ceviche so I took on the task. I have made it before, but the pressure was on making it for my mother who taught me in the first place. By the end of the night, she told me it was better than her ceviche and I literally almost died. My mom is one of the greatest cooks I know and she never fails in the kitchen so that compliment was everything. This recipe is super easy and I know I always say that but that’s because they really are! It takes about 20 minutes to prep but it’s really a breeze after that. Now I personally don’t like ceviche with anything raw. No raw shrimp or fish I need it cooked! If you like the raw stuff than do yourself a favor and make sure you get a good quality piece of fish or shrimp. 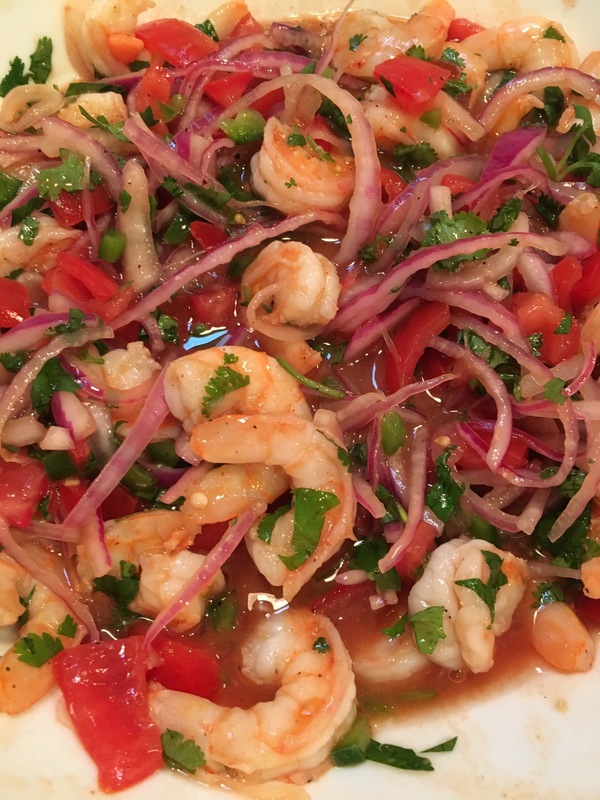 Before you start chopping, cook your shrimp if you have uncooked shrimp. If it’s already pink and cooked but cold that’s fine just leave it that way. 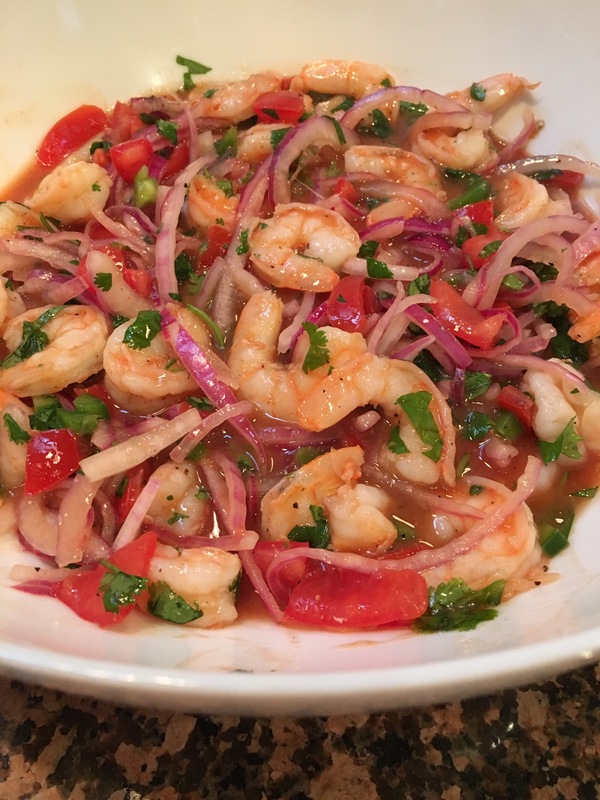 To cook the shrimp, make sure there are no tails and sautée in a tbsp of olive oil and season with a tsp of salt, a tsp of pepper and a tsp of onion powder and cook until pink. They cook quick so do that then remove from heat so they can chill while you prep everything else. While your shrimp cool, get a large mixing bowl. Add your sliced onions first with the lemon juice and tsp of salt. Mix together and let sit while you chop everything else. The salt will help take the harshness out of the onions and extract the juices. Add your other ingredients and give it a good mix. Add your shrimp last and cool immediately for 30+ minutes in the fridge. It lasts about 4 days in the fridge.